“Seventy years ago, the people of Palestine suffered a grave historical injustice with the creation of the state of Israel on Palestinian land and the forcible dispossession and expulsion of 750,000 indigenous Palestinians. Such a process of uprooting, displacement, destruction, and oppression persists until today— Israel continues to commit egregious violations of international law and human rights against the Palestinian people; it still acts with impunity and enjoys full immunity. Yet, rather than hold the belligerent occupier to account, the United States administration and members of Congress are bent on targeting the most vulnerable segment of the Palestinian population and redefining the status of Palestinian refugees in order to eradicate them as an issue and to destroy their rights as stipulated by international law and conventions. Jared Kushner, a senior advisor to US President Donald Trump who has been placed in charge of brokering peace between the Palestinians and Israel, is doing Israel’s bidding and working to take the issue of Palestinian refugees off the table. According to Foreign Policy, in a recent email to US President Trump's Middle East Envoy Jason Greenblatt, Kushner wrote, ‘It is important to have an honest and sincere effort to disrupt UNRWA.’ [i] Kushner seems to be determined to hand over the responsibility of the Palestinian refugees to their host countries who are supposed to absorb them in order to eliminate any chance of implementing the right of return. To make matters worse, Congressman Doug Lamborn, a Republican representing the 5th district of Colorado, introduced H.R. 6451, UNRWA Reform and Refugee Support Act of 2018, on July 19 which aims to change the United States’ definition of a Palestinian refugee and to limit assistance to UNRWA and to redirect it to ‘the Administrator of the United States Agency for International Development for providing assistance to other populations in need in the West Bank, Gaza, Jordan, Lebanon, and Syria.’[ii] In a press release, Lamborn stated, ‘This bill ensures that U.S. taxpayer dollars dedicated to refugees should only contribute to UNRWA to the extent that it resettles the original refugees from 1948, not the great-grandchildren who may have not even grown up in the Middle East but comfortably in other nations.’[iii] This is a very disingenuous way of reinventing the definition of a refugee and applying it only to the Palestinian refugees in order to rob them of their rights and to maintain Israel's Jewish exclusivity. 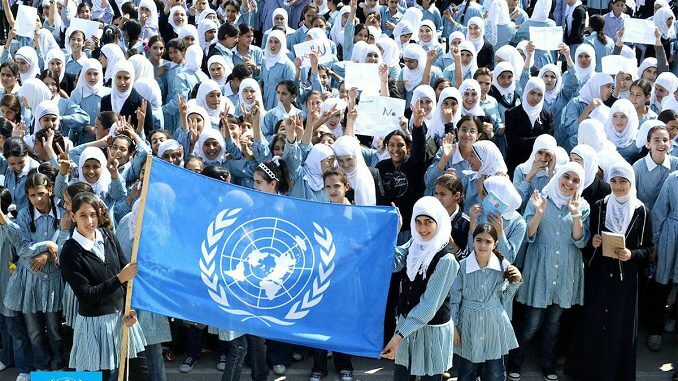 Such a campaign targets more than 5.3 million people, many of whom continue to endure grave hardships and deprivation and have suffered repeated displacement, and threatens to defund UNRWA; in addition to being illegal and irresponsible, it is also extremely cruel and inhumane. The US has no mandate to abrogate the rights of Palestinian refugees or to amend international law and consensus unilaterally for the benefit of Israeli impunity and violations, including its racist policies as clearly articulated by its ‘Jewish Nation-State Law’. Any developments that threaten the continuity and scope of UNRWA’s mandate and responsibilities would create unimaginable suffering and would destabilize the entire region, while undermining any kind of justice or genuine peace. Such efforts targeting the Palestinian refugees and disbanding UNRWA are part of the United States’ systematic campaign to destroy the requirements of peace by taking all permanent status issues off the hypothetical ‘table’ of negotiations— Recognizing Jerusalem as the capital of Israel, relocating the American Embassy from Tel Aviv to Jerusalem, omitting mention of the 1967 borders and the two-state solution, refraining from addressing the illegality of the Jewish settlement enterprise, dropping the term ‘occupation’ from official statements, and attempting to turn Gaza into a humanitarian and economic issue rather than a political issue to maintain its separation from the occupied West Bank— All constitute dangerous steps that destroy the core requisites of any solution, let alone an “ultimate deal.” By accommodating Israel’s extreme and unjust demands and policies and adopting its exclusionary and racist narrative, the United States has become complicit in Israel’s military occupation and war crimes.